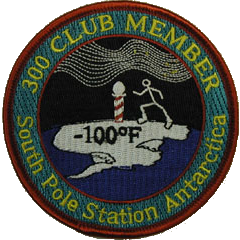 The 300 Club is a mid-winter activity at Pole so named for the -300°F temperature shift one experiences when running from a +200°F sauna to the Pole and back when the outside ambient temperature hits -100° or below. The air is so dry here that it's possible to sit in a sauna that warm without getting scalded, and it's also possible to make a several minute walk to the Pole and back without losing fatal amounts of body heat. Air is a poor conductor of heat, and ultra-dry air at two-thirds of sea level pressure is even worse. Still, there are some safety-related traditions, such as the buddy-system (never do the 300 Club alone), wear shoes or boots, and there's no shame in wearing gloves or a face-mask. There is a sauna in the new station, but I was happy to take the traditional route from the Upper Berthing sauna, down the tunnel, out the dome entrance, and up the ramp. Next year, I doubt folks will have the choice. We've had an exceptionally good year so far for opportunities to join the 300 Club. I was walking back from MAPO the first time it hit -100°F, and missed out. When the second time came around a month later, I jumped all over it. Amazingly enough, the next chance came around exactly one week later, and lasted almost 24 hours, resulting in a group run of a dozen, followed by groups of two to three at various times over the next day. I'm sure that when the temps and wind get low again, even more of us will brave the cold to join the Club. (on 21 July, it was once again cold enough to try again. 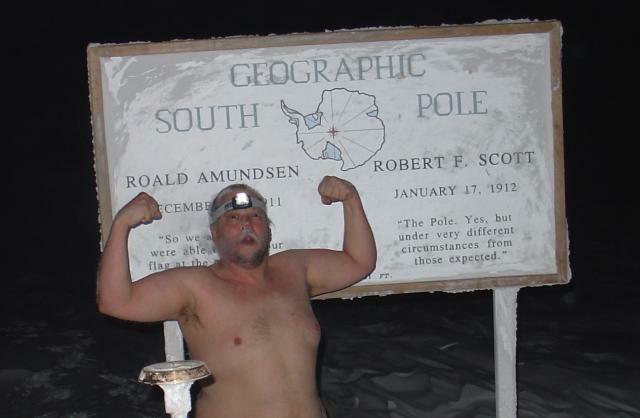 A few of us loaded into the sauna and made another mad dash to the Pole. This time, though, there was someone waiting there to take my picture. For the record, it was -102.5°F (-74.7°C) at the time). © Copyright 2004-2005, Ethan Dicks (contact me). All rights reserved.